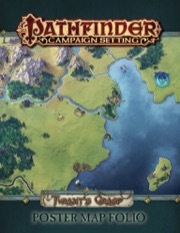 From the crumbling spires of the ancient Runelords in distant Varisia to the bustling merchant kingdoms of the Inner Sea, the Pathfinder Campaign Setting forms the panoramic backdrop for Paizo Publishing's innovative Pathfinder fantasy roleplaying supplements, modules, and Adventure Paths. The hardcover Inner Sea World Guide is a definitive guide to the primary adventuring locales of the Pathfinder world of Golarion, and is the perfect first step in your journey into this exciting, multiple award-winning fantasy campaign setting. Detailed sections on more than 40 nations—from the frigid horrors of the Lands of the Linnorm Kings to the haunted halls of diabolical Cheliax—provide a full picture of this thrilling new world, with new rules, new magic and spells, detailed descriptions of more than twenty gods and their religions, and a gorgeous poster map detailing the lands of the Inner Sea. Additionally, Paizo releases several Pathfinder Campaign Setting supplements every year, with topics ranging from in-depth looks at the priests and pantheons of Golarion to detailed guidebooks to the nations visited in popular Pathfinder Adventure Paths and Pathfinder Modules. The Pathfinder Campaign Setting provides classic adventuring style and cutting-edge game design optimized for use with the Pathfinder Roleplaying Game and suitable for use with all fantasy roleplaying systems! The world of the Pathfinder Roleplaying Game comes alive in the Pathfinder Campaign series! From the crumbling civilizations to bustling merchant kingdoms, the Pathfinder Campaign Setting details the world of Golarion, the official backdrop for the Pathfinder adventures and fantasy roleplaying supplements. With topics ranging from in-depth looks at the pantheons of Golarion, guidebooks on it's nations, supplements for Pathfinder adventurers, and gorgeous map folios of select regions, the Pathfinder Campaign Setting line is the perfect enhancement and companion to your Pathfinder campaign. Paizo releases Pathfinder Campaign Setting volumes monthly, with each issue exploring new facets of the world of Golarion. With your ongoing Pathfinder Campaign Setting subscription, we'll send you each new Pathfinder Campaign Setting volume and charge your payment method automatically as we ship each product. You only need to sign up once, and never need to worry about renewal notice or missed products. By starting a Pathfinder Campaign Setting subscription, each release will be automatically bundled with any other Paizo subscription items you're subscribed to releasing in the same month. When you start an ongoing subscription, any existing preorders for products covered by that subscription are automatically cancelled (or have their quantity reduced by one if you've preordered more than one of an item). Have more questions about subscriptions? Check the Paizo Subscriptions FAQ for more details. You may change your starting product during checkout. The Pathfinder Campaign Setting is my absolute favorite of all my subscriptions. If you love the Pathfinder Campaign Setting/Golarion then this the best choice. I will likely never use all the cannon found in all the books I have–but part of the fun of RPGs is that it's just as fun to read about/imagine as it is to play. Most recently, the intros in this line have been off the hook. Hell Unleashed and Occult Mysteries intros are my favorites so far. I enjoy those two intros equally to the entire book. This particular subscription provides GMs with a barrage of additional flavor and twists they can hurl at the unsuspecting masses. It is unlikely each player will want to purchase copies, I know that I devour these books in order to provide a greater immersion for those that play. Might I suggest a Pathfinder Chronicles Lite subscription? A subscription that has all the Pathfinder Chronicles products, minus the card decks? The gamemaster cards do look cool, but I don't think I will be using them. I still want to enjoy all the flavorful goodness of the other products and would happily subscribe for them. I second the "Pathfinder Lite" motion. You will probably find some answers here. I can't get the link to work, but I'll add my voice to the "Cronicles lite" desire. I'm really not so interested in the Harrow deck, but I want the other stuff. For what it's worth, Paizo has announced that the item cards are off of the Pathfinder subscriptions. The Harrow cards are tied pretty strongly to the Crimson Throne adventure path though, and I think the argument that they are part of that product is much stronger. The link did not work because there is a space between the "t" and the "s" in "Products". If you delete that before going on, that will work. It wasn't the poster—our board broke the line. I've linkified it so it works, though. Harrow Deck -> Classic Monsters -> Gazetteer -> etc.? Or what? Thanks in advance! When you subscribe, it'll start with whatever is currently out which could be the Classic Monster revisited book or it might start with the next item, that I'm not sure. I subscribed when only the Burnt Offerings item deck was out & had the option of either starting with those (which meant I got it) or to start with Monsters. When you subscribe, during checkout, you get to choose whether to start with the current volume (currently Classic Monsters) or the next (currently the Gazetteer). Once the Gazetteer ships—which may be later this week—you won't have the option to start with Classic Monsters anymore. WOnce the Gazetteer ships—which may be later this week. Eeeeee! I am so excited about this. You guys are breaking my bank, but it's worth it. Will this reeeally be out later this week? I missed an update. Looks like it will probably be next week. Alright, so I just started my subscription with the Gazeteer, now if I buy previous books of the subscription will I be able to get the pdfs of those? Nope, only actual subscription products get the free PDF. The free PDF was established to convince people to maintain their subscriptions rather than cherry-picking the products that they wanted. So the only way to get the free PDF is to be a subscriber when that products ships. Back stock in any line do not come with the free PDF. Now, since you are a Pathfinder subscriber, you can buy the PDFs at 15% off the already discounted PDF price (we generally price our PDFs about 30% cheaper than the print product). But you can't get them for free. That's reasonable. Thanks for the answer. So not to be contrary, but I'm wondering what the benefit of subscribing to this (or the Companion series) is. - It's list price plus shipping with the subscription, when I can get it from Amazon for a good discount and usually free shipping. - Even if I wait and buy from my FLGS at full price I don't pay shipping. - Buying via Amazon/FLGS I can then pick and choose and avoid products I don't want (like the cards). - Buying onesie-twosie I'm sure to skip some products just out of not staying on the ball with it, which equates to lost revenue to you. Basically the upsides of me subscribing are "convenience" and "the PDF"? Not worth $5-$10 or more per product to me (the Amazon discount + your shipping). I think you'd get a lot more subscriptions if you discounted the other lines 30% like with the APs themselves. Subscription revenue is the best kind of revenue to have. I know I'd swap over from buying onesie-twosie for a 30% discount and think a lot of others would too. Speak for yourself - I find the pdfs to be worth the price of subscribing. An additional $10 a pop for the same content, just in PDF? Enjoy. I do, but then again, I'm also not taking some absurd scenario to calculate the cost ($10 is b+@$~#~$). The last Pathfinder volume I received was $13.99. Amazon has it for $14.97. Last time I checked, shipping was < $10. Plus I get an additional discount on my other subscriptions as a Pathfinder charter subscriber. Try running the numbers again. I pay the same price as I would at my FLGS and I get a pdf. That's a good deal in my book (or on my books, as the case may be). Is it the OMG World's BEST DEAL!!1!one!! buy right now!?!?! Probably not, but I'm happy with my purchase. I just wanted to point out that because you are a Pathfinder subscriber, you actually would get 15% off on any other subscriptions that you take because you would have the Pathfinder Advantage. That, and you would get the free PDFs. I think you'd get a lot more subscriptions if you discounted the other lines 30% like with the APs themselves. We have to be careful about the number of products that we offer subscriber discounts on—if we discounted *everything* below list price, we'd risk alienating retailers. That's why we provide other perks like free PDFs and the ability to combine shipments of multiple subscriptions to save on shipping (and in the future, you'll be able to combine non-subscription and subscription items as well). And, as Lisa pointed out, Pathfinder Adventure Path subscribers get the Pathfinder Advantage discount of 15% off MSRP on most items, including other subscription items. Ah, I didn't know that, that does help sweeten the deal. Thanks. I do, but then again, I'm also not taking some absurd scenario to calculate the cost ($10 is b%*!!@&@). The last Pathfinder volume I received was $13.99. Amazon has it for $14.97. Last time I checked, shipping was < $10. Plus I get an additional discount on my other subscriptions as a Pathfinder charter subscriber. Yeah, I ran the numbers right the first time. Pathfinder Chronicles: Gazetteer. $17.99 list, $12.23 Amazon. Guide to Korvosa: exact same. Classic Monsters Revisited: exact same. Lowest cost shipping, USPS 4-8 day to Austin, TX - $5.08. $5.08 + $5.76 = $10.84. Boy, that's suspiciously close to $10. The 15% discount Lisa mentioned (and I see it now when I add individual items to my cart- when you add the subscription it just says "list price", which is probably bad marketing) takes it down to $8, which is definitely better. I love Paizo too dude, but don't go so overboard in "defending" them that you decide to ignore facts. Your exclamation mark key will thank you. Totally understood, but I think they'd be OK with it if it were the subscription model (I used to work in publishing). In fact, the 15% discount on single products is more of a 'threat' than a 30% on a subscription I'd think. Anyway, just a thought. Direct revenue is way better than through the retailers, and subscription revenue with its guaranteed cash in future months is super duper desirable. If you could make it work it's more $$ for y'all. You're not including the shipping cost of the Amazon purchase (which was around $5 when I just ran it, total price was just over $17). Now if you factor in the combined shipping with your Pathfinder subscriptions (which shouldn't raise your shipping cost much), you're looking at about the same price as the Amazon purchase, maybe a little less. And you get the free PDF also. So to me, yeah it makes a lot of sense. Only chumps pay shipping from amazon. Buy your monthly chronicles and AP at the same time -> $25 order -> free shipping. Anyway, I'm not contesting that it's worth it to some people. I am contesting that it's compelling enough to get the people who would otherwise be interested - like myself, a Pathfinder subscriber, enthusiastic about Pathfinder RPG, etc - to do it. I'm not b!#$*ing, I'm suggesting to them that they have a bunch of demand right under the surface that could be converted to tasty tasty subscriptions if it made sense to the average person. <====Lives in China. No FLGS. Amazon shipping no better, usually worse. I'm really starting to question whether the subscription is worth it. The free PDF and 15 percent off other orders really doesn't add up for me. If you're willing to be patient, you can order multiple items from Amazon at a significant cost savings. I like supporting Paizo, but I'd prefer it if they could waive the shipping cost or not charge me cover price for each issue. 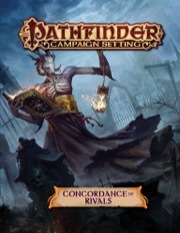 I know it's not an apples to apples comparison per se, but Pathfinder is the only subscription I have that doesn't offer me some kind of savings off the cover price. I think you may be confused.... Pathfinder Adventure Path Subscribers get 30% off the cover price, *plus* the free PDF, *plus* the 15% off MSRP on almost everything in the store, including other subscriptions. If I subscribe to the Chronicles beginning with the Guide to Absolom and choose Hold for Monthly Shipment, will the Guide and the Second Darkness Map Folio both ship at the end of the month with my AP subscription? I would also put in for a Lite subscription, although I would ask that it only contain "rules" releases instead of "rules and setting" releases. I have my own setting already. Is this subscription still supposed to be one book a month? Currently there are two books listed for October and three for November. Is this just to to publication dates slipping? The Chronicles sub has never been a monthly subscription. We occasionally plan months with no products, and months with two (though one of them will usually be lower-priced). But yes, this particular situation for October and November is due mainly to slipped schedules. What I can't figure out, and I might just be missing it is the "cover price". Anyone know what price a buyer is looking at for the subscription? Cover price means the price of the item in the store. If you go look at any specific item in the line the "Cover Price" is the listed price. In the Chronicles line it's generally $19.99. Yes—we can't be explicit about it, because the products in this line won't necessarily always have the same price. You can see the prices of upcoming products here. So, the "Pathfinder Chronicles" line has been renamed "Pathfinder Campaign Setting"? Yep. A few other things have changed as well. More information here. I'm a little confused - under the pathfinder/campaign tree are two subtrees .. 3.5 and Pathfinder RPG can anyone explain the difference between these? It merely represents which system the books were released for. The books in the 3.5 section were all released before Paizo published the Pathfinder Roleplaying Game and were written for D&D 3.5, since that was the default system at the time for Paizo. All books released after Pathfinder RPG came out (August, 2009) have been written for the Pathfinder RPG, since that's now the default system for Paizo's products. So by clicking the 3.5 link, you see the list of books written for D&D 3.5 (prior to August, 2009) and by clicking the PFRPG link, you get a list of the books written for Pathfinder RPG (all books after August, 2009). The first books released were designed for the D&D 3.5 ruleset. Then, Paizo decided to make their own Pathfinder rules. Since the core rulebook was released, everything has been designed for PfRPG rules. Basically, the 3.5 stuff is older than the PfRPG stuff (and may require some conversion). is there any way to subscribe to this without getting all the map folios? I am seriously in love with the upcoming line of books, and even the ones im only meh about i'd be willing to pick up on a subscription... but the map folios seem a bit odd under this subscription. is there any way to subscribe to this without getting all the map folios? There is not. However, since the Council of Thieves Map Folio, we've made efforts to make the Map Folios more useful to people playing in our setting who aren't running the Adventure Paths. Where the AP-themed folios used to reprint the small location maps from the APs themselves, they now consist entirely of poster maps that present noteworthy large-scale areas useful to anyone adventuring in those areas. For example, the Serpent's Skull folio consists of three poster maps: the island of Smuggler’s Shiv, the City of Seven Spears, and Ilmurea, the underground serpentfolk stronghold. The free PDF was established to convince people to maintain their subscriptions rather than cherry-picking the products that they wanted. So the only way to get the free PDF is to be a subscriber when that products ships. It seems to me that you should have a middle-of-the-road option. For example, come up with a bundle price for book+PDF that costs more than just the book, but less than the book and the PDF separately. Even getting the PDF for a sharp discount like 20% of the stand-alone price would still encourage subscription. Two books for June and four for July. You guys are killing me....hopefully some of these slip! I know Vic said it was never a monthly subscription earlier but I could swore that was on the description of the sub at one point. The maps also at one point had a alternate between map pack and flip map every other month but that doesn't seem to be the case anymore. Its getting to the point of having to decide to stop a subscription not due to a product I don't like but due to just to much coming out a particular month. Inner Sea Magic was originally announced for August. It's not too often you see one of these bumped up instead of back. I wouldn't be surprised to see that one slip back into the August slot since there's currently nothing slated for that month in this line. July/August is always brutal because of GenCon. On the other hand, August/September tends to be light for the same reason. We definitely never said this sub was monthly, but we do nonetheless generally plan about 12 releases per year. And Map Packs and Flip-Mats are indeed supposed to be alternating, on a monthly basis. The problem is that this is all predicated on things happening on time, and that's not always what happens. We got very behind this year, largely due to problems in the AP line, but also partly due to the Inner Sea World Guide taking longer than we anticipated. The good news is that, when it comes to getting stuff to the printer on time, we expect to be largely back on track in about a month (well, except for Planet Stories, which always gets the short end of the scheduling stick...). The bad news is that, since it takes a few months for stuff to get printed, our actual *releases* won't be fully back on schedule until August, and until then, some lines that have had months without products will have catch-up months with two products. We'll get a clearer picture of just when that'll happen as August approaches, but for now, I wouldn't be too concerned—stuff *will* be sliding back and forth. I especially wouldn't worry about anything so far out that it doesn't yet appear on the Product Schedule page—and even then, stuff scheduled for three months out still has a chance of moving either way.